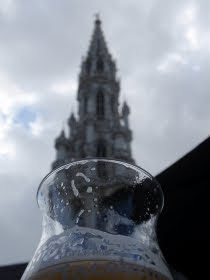 Thirsty Pilgrim: The Brussels Glass — Currently Half Full. I've been pondering a letter in last week's Bulletin, Belgium's long-running and popular English-language magazine. David Macdonald is the writer's name. The letter is about Brussels. So when the question is asked "How might we improve our city's image to visitors? ", I am tempted, aside from some obvious cleaning up of our filthy streets, to reply, "Why should we?" Let's face it, we are the ones who live here. It's our city. Hidden behind its dull external Europolitic image is one of Europe's best kept secrets — a quirky, shabby, lovely, ugly, graceful, animated, and above all wonderfully human, surprise. I am proud of Brussels and love introducing my city to visitors, but that doesn't mean I have to nurture its image for their benefit. Take it or leave it, love it or hate it, it's what it is. I'm reminded that whether a person loves a city has more to do with the person than the place. My wife and I occasionally meet fellow expats who absolutely hate it here and can't wait to leave. They're on another planet. Loving or hating where you live takes effort either way. Effort takes determination. As an acquaintance once told me, "Love is not a feeling. It's an action." It takes work. With that in mind, here's an article in the latest Tribune de Bruxelles, a local rag (and I mean that in the best possible sense). The focus is on those who are working to promote craft beer locally. Specifically mentioned are Yvan de Baets and Bernard Leboucq of Brasserie de la Senne, Cantillon, the Moeder Lambic team, several discriminating cafés and shops, and our little book. Speaking of Cantillon, the semiannual Public Brewing Session is Saturday. "Lou Pepe" himself, patriarch Jean-Pierre Van Roy, will briefly step out of retirement to brew his last batch of lambic. Then he will hand the proverbial mashing fork over to son Jean once and for all. Now I will make explicit what must have been this blog's subtext for many months: An energetic and creative new generation is taking over the local beer scene. It's their city now. I am always selective on who I recommend Belgium as a travel destination to. It comes down to this- I like it almost being like a well kept secret that isn't on most peoples' radar. I hesitate to send anyone who won't appreciate it for its great beer, amazing food, and quirky inhabitants because anyone looking for "Disney" Europe will walk right past these things and be disappointed. My deepest fear is that tourists will descend on Belgium in droves and it will start catering to them, isntead of remaining its own eccentric, flavourful, and unique self. I always suspected that's why Rue des Bouchers exists. To punish the unsuspecting tourists who haven't done their homework. It still wouldn't hurt to clean up the dogshit.